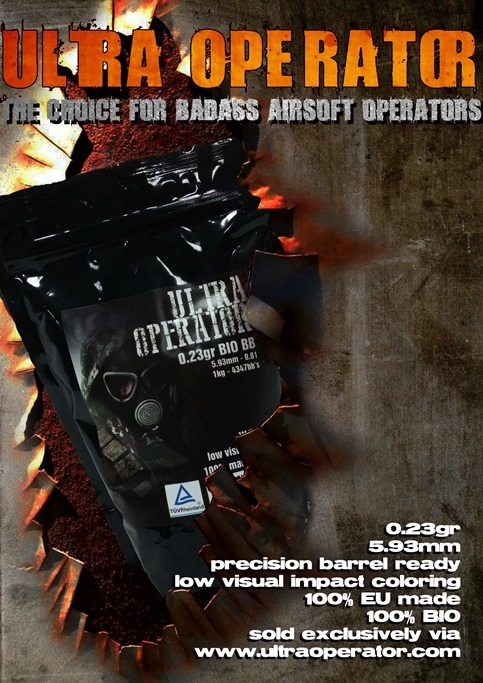 Hey guys, just to let you know that we received the first batch of the all new UltraOperator BBs. Available only in 0.23gr at this stage, fully bio degradable, dual tone with color choice for a low visual impact and a 100% European made product. Especially designed for use in high powered replicas with precision barrel. Attention, the use of these BBs can create a instant overdose of awesomeness and could potentially attract swimsuit models … handle with care. Available in our webshop and don’t forget to visit our facebook page as well.